JHB is a Virtual Airline for Flight Simulator pilots. 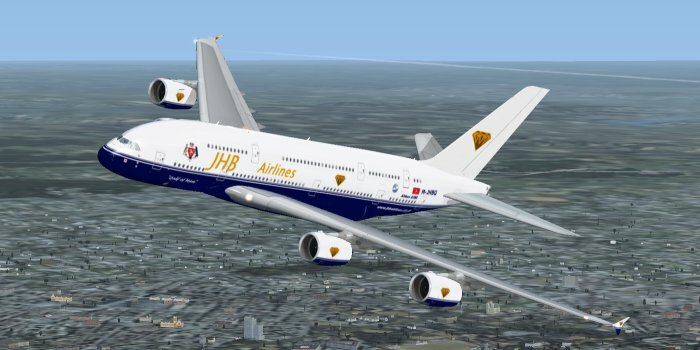 Our operations may be conducted either offline either alone or in company with other JHB members using the superb tool JoinFS, or online using the online server and ATC systems VATSIM or IVAO. Our operations are tailored to pilots who are familiar with the FSX family or X-Plane and who wish to fly in a relaxed environment, rather than on fixed schedules or tasks. Any aircraft may be flown, although preferably one from the comprehensive FSX and FSX-Steam fleet which we maintain at our bases at Liverpool and Ronaldsway. A fleet of aircraft for X-Plane 11 is in development. JHB Airlines has its own members' forum. for discussion about anything regarding flight simulation. You can register on the forum and request a crew number. Once this is allocated, you can fly under the JHB flag and record your flights in our PIREP system. the only restriction is that new members must file a valid PIREP within one month of joining. Any questions you have will be swiftly answered on the forum.